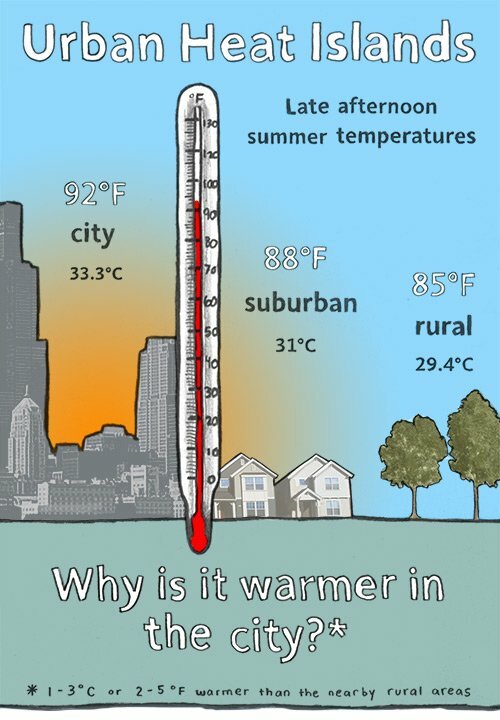 Urban heat islands – why is it warmer in the city? Summer in the city can be especially hot and sticky, because urban heat islands exacerbate the warm weather. Researchers at Berkeley Lab are testing materials that battle that effect, making pavements cooler and safer. Urban surface properties. Roofs and pavements can constitute about 60% of the surface area of a U.S. city. These surfaces are typically dark in color and thus absorb at least 80% of sunlight , causing them to get warmer than lighter colored surfaces.1 These warm roofs and pavements then emit heat and make the outside air warmer. Human activity. Air conditioning, manufacturing, transportation, and other human activities discharge heat into our urban environments. Urban heat islands can negatively affect the urban community and the environment. Increased energy use. Warm temperatures in cities increase the need for air conditioning (A/C) to cool buildings. This elevated demand can strain the electrical grid on a hot summer afternoon, making it more susceptible to brown-outs and black-outs. Impaired air quality. Warmer air accelerates the formation of smog (ozone) from airborne pollutants like nitrogen oxides and volatile organic compounds. Elevated demand for cooling energy in the form of A/C use can also increase the emission of air pollutants and greenhouse gases from fossil-fuel power plants. Illness. Higher air temperatures and lower air quality can aggravate heat-related and respiratory illnesses, and also reduce productivity. On sweltering days you can fry an egg on them. But, now, Lawrence Berkeley Lab and UC Davis researchers are testing surfaces designed to make them cooler and safer. Scientists at UC Berkeley and Lawrence Berkeley National Laboratory’s FOLIUM Project, funded by ARPA-E, use light to convert the carbon in tobacco leaves into biofuels.